*I should confess that for this typecast I used one of those cheap Chinese ribbons which were being sold on Australian eBay (not sure if they are still being listed). Anyway, my experience with these is that they are nowhere near the quality of the Malaysian-made Fullmark ribbon. For one thing, I have found the spools to be by no means "universal". For another, there seems to be far too much "splattering" of ink all over the place. Robert, you buy this junk so we don't have to. Right? As painful as it is to admit it, the answer is "Yes". Now I have the worry of trying to get rid of it! I take it the typewriter looks much better than it could ever type. It may look OK, Bill, but it types like a lemon, a sick parrot, a rotten tomato. It's rubbish. I just noticed that it has a rupees sign. Probably it's responsible for starting the Indian switchover to computers. Someone suggested that since my Olivetti Lettera 41 had a yen symbol, it must be made for the Japanese market. I doubt that very, very much. I've never seen an Olivetti advertised in Japan from this period, although they did market strongly there in the early to mid-60s, before Brother etc got a stronghold. I don't think you could make a Western-keyboard typewriter in Spain that would compete for price with a home-grown Japanese machine, for one thing. The only four Lettera 41/42s I have ever seen were in Oz, NZ and Holland. I just think that in this period, Olivetti was covering its bases and widening its range - and, more to the point, lowering its costs. It wouldn't surprise me to find Olivettis with pounds, dollars, rupees/yen on the one keyboard. 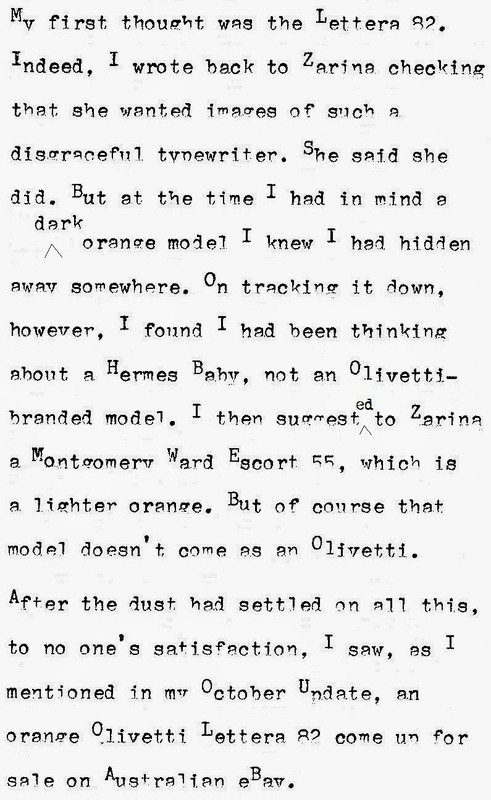 I wonder if you could drop the better-working guts of an earlier Hermes Baby/Rocket or Empire Aristocrat into that nice orange shell? Make a HermOvetti! 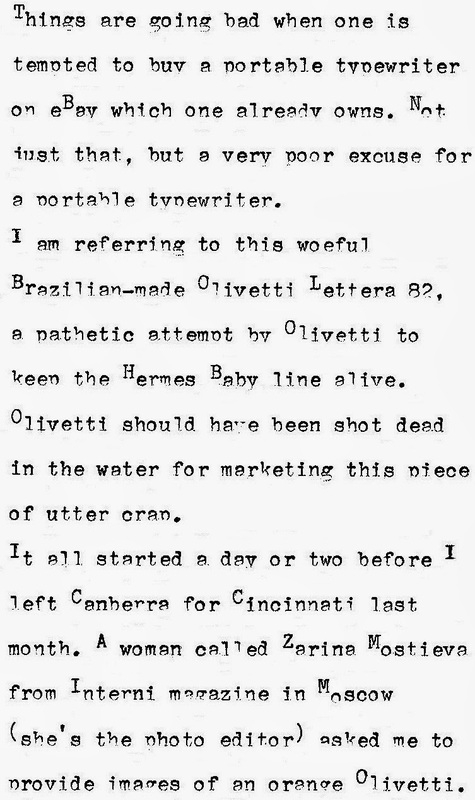 Olivetti would probably have cheered when Oz and NZ dropped the pound for the dollar in the mid-60s. Remember, it's not just a keptop, it's a changed slug as well. Hey Ted, I'm going to try that RIGHT NOW!!! Thanks, mate, great idea! It gets worse than the Olivetti... the Royal or Roy-type version of the same machine, the ME-25 Extra is actually just slightly more shoddily built. Perhaps a -102.3 on your scale. I own one of each. You really need to try an Olivetti Lettera 12. The twelve is without doubt the most execrable device ever put into production and to expect humans to pay money for this 'thing' is malevolent lunacy. I just purchased a Hermes Rocket made in Brazil, please tell me I didn't purchase a machine as bad as the Olivetti Lettera 82!